I am on a number of email lists as you can imagine. One email, sent out by the Fort Worth Chapter of Hadassah last week, highlighted an amazing medical story straight from Hadassah Medical Center. The gist: An Orthodox Israeli rabbi may have been cured of amyotrophic lateral sclerosis (ALS), also known as Lou Gehrig’s Disease. The new treatment is based on stem-cell technology and now in clinical trials at the Hadassah University Medical Center. This piqued my interest and, coincidentally, the very same day, Dallas Chapter of Hadassah president Terri Schepps also informed me of an interesting program that will include a first-hand report on stem cell research coming up next month when Hadassah continues its 100th centennial celebration. The event will take place from 2-4 p.m. Sunday, Aug. 26, at the Museum of Biblical Art, 7500 Park Lane in Dallas. This elegant Kosher dessert event will provide the latest information and development at Hadassah in Israel. The program will open with a special appearance of the Temple Emanu-El Choir, performing High Holy Day melodies. Hadassah’s very special guest speaker is Linda Jayaram, a Hadassah multiple sclerosis stem cell trial participant. Linda is a member of Hadassah in Houston and will travel here along with her husband, David Barish, to share her personal experience and participation in the clinical stem cell trials at Hadassah Hospital in Israel. Attendees will learn first-hand why Hadassah’s Multiple Sclerosis Center is the global leader in stem cells. The final part of Hadassah’s program will include the presentation of the Sarah Mendel Susman Award. This award is given to a member for their extraordinary service to the Dallas Chapter of Hadassah and untiring devotion to its ideals. The award is given in loving memory of Sarah Mendel Susman, a former chapter and Southwest Region president. The recipient is traditionally kept secret until it is presented as a highlight of a major chapter event. Invitations will be mailed to all Dallas Chapter members and should be received by the first week of August. The cost of the event is $36, and seating is open. Several sponsorship/recognition opportunities are available. All sponsors will secure reserved seating. A PDF of the invitation along with sponsorship opportunities are on the Dallas Chapter website www.hadassah.org/dallas. RSVPs are requested by Aug. 15. You can also email chapter.dallas@hadassah.org or call 214-691-1948 for more information. Temple Emanu-El’s program director, Karen Hoffman, was kind enough to share some of the good works of the synagogue with us recently. 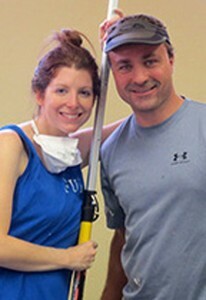 Temple Emanu-El volunteers Monica and Eric Hirschler helped redecorate the community room at the Peebles Apartments. Monica coordinated the project. For two weeks in July, Temple Emanu-El’s Camp K’Ton welcomed and hosted children from Family Gateway (July 3-6) and Vogel Alcove (July 9-13). This gave underprivileged youth an opportunity to experience a fabulous summer day camp and also enriched the lives of Temple Emanu-El kids with the opportunity to make new friends and share their camp experience with other children from nearby neighborhoods. This was the project’s first year and was a collaborative effort between those organizations, Temple Emanu-El’s ECEC and Temple Emanu-El’s social justice program. 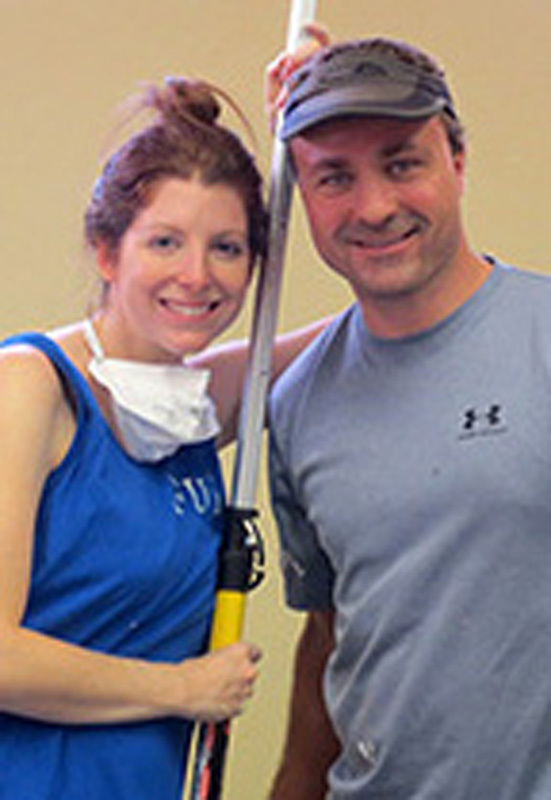 Also this month, Temple Emanu-El has been working in the Vickery Meadow neighborhood, painting, cleaning, installing new floors, and providing new furnishings at the Pebbles Apartments Community Room. This is part of Temple Emanu-El’s Vickery Meadow Committee of Social Justice, benefitting the residents in that community. Pebbles Apartments are permanent supporting housing for women and children who are coming out of homelessness. All women who live in the apartments are receiving some kind of services, from mental-health treatment to job training. They have a community room that is used for classes for the moms and also to provide lunch for the children who live there. Temple volunteers have been helping with all areas of this refurbishment project. Yasher Koach! Mazel tov to Frisco’s Dr. Gail Lebovic, this year’s recipient of the “Spirit of Achievement Award” from California Spirit, Southern California’s largest gala fundraiser benefiting the American Cancer Society. The award will be presented to Lebovic, who is the chief medical officer of Focal Therapeutics, at California Spirit 2012. The event will be held Sunday, July 29, at the Pacific Design Center in West Hollywood. California Spirit has raised more than $14 million for ACS’s lifesaving research, education, prevention and free patient-service programs during the past 28 years. Founded in 1985 by Wolfgang Puck, Sherry Lansing and Barbara Lazaroff, California Spirit features gourmet cuisine, premium California wines, live entertainment and a silent auction. In addition to her pioneering clinical work as an oncoplastic surgeon, Lebovic has founded numerous medical device companies and is one of a select group of women to hold numerous patents. She is internationally known as an inventor of the MammoPad and other innovative devices in women’s healthcare. Lebovic spent more than a decade as an attending surgeon at Stanford University Medical Center and later served as associate director of the Lee Breast Center at the University of Southern California and director of women’s healthcare at the Cooper Clinic in Dallas. She is past president of the American Society of Breast Disease. George Hermann, CEO and lead engineer at Focal Therapeutics, noted that the team’s most recent efforts show promise for many patients undergoing breast surgery. “We hope the new BioZorb tissue marker will be yet another significant technology in the field of breast healthcare that we have developed with Gail,” he said. Lebovic also consults, educates and advises physicians and surgeons on the use of devices she has invented and helped to develop. She just finished her two-year presidency of the Frisco-based American Society of Breast Disease. Lebovic, the wife of Jim Zoller and daughter of Holocaust survivors Ernest and the late Helen Lebovic, is a member of Congregation Anshai Torah in Plano.